Announcing an all-new Self-Paced Training Kit designed to help maximize your performance on 70-643, the required exam for the new MicrosoftÂ® Certified Technology Specialist (MCTS): Windows Server 2008 Application Platform Configuration certification. This 2-in-1 kit includes the official Microsoft study guide, plus practice tests on CD to help you assess your skills. It comes packed with the tools and features exam candidates want most including in-depth, self-paced training based on final exam content; rigorous, objective-by-objective review; exam tips from expert, exam-certified authors; and customizable testing options. It also provides real-world scenarios, case study examples, and troubleshooting labs for skills and expertise that you can apply to the job. Work at your own pace through the lessons and lab exercises. 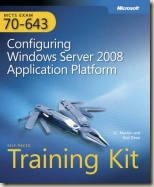 Focusing on Windows Server 2008 Application Platform technologies, this official study guide covers Terminal Services, Web Services infrastructure and security, Media Server, Microsoft WindowsÂ® SharePointÂ® Services server options, File Server, Print Services, network maintenance, and Simple Network Management Protocol. Then assess yourself using 300+ practice and review questions on the CD, which features multiple, customizable testing options to meet your specific needs. Choose timed or untimed testing mode, generate random tests, or focus on discrete objectives. You get detailed explanations for right and wrong answers including pointers back to the book for further study. You also get an evaluation version of Windows Server 2008 and an exam discount voucher making this kit an exceptional value and a great career investment.